The TF-445 road project—a narrow road that connects the local municipality of Buenavista del Norte, with the Punta de Teno’s lighthouse located on the northwest coast of Tenerife, Canary Islands (Spain). Over many years, there have been constant rockfalls that have threatened the road safety, and furthermore, have caused the road closure on several occasions. This project is a clear example how Maccaferri’s Rockfall mitigation solutions serve to solve the various environmental and construction-linked challenges found in demanding construction projects. The TF-445 road runs through an extremely mountainous abrupt area with very high slopes that are made up of basalt, slags, and other volcanic materials. The hills have begun to erode due to constant rain and wind damage, thus causing heavier segments of the wall to detach and fall. 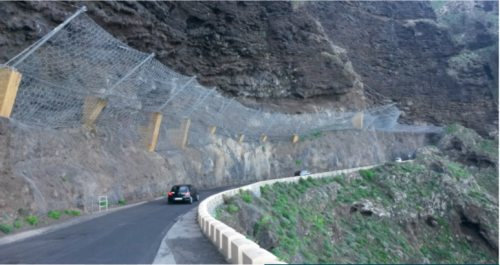 Maccaferri was chosen to install Rockfall Barriers in the TF-445 road project. two kinds of barriers were installed—Rock fall Barrier RMC 300A, RMC 500 A—to accommodate the varying degree of rock fall danger in different parts of the trajectory. Currently, Maccaferri’s barriers continue to safeguard both the roadwork’s and the public. To know more about this project download the new Case History. For more information about Rock fall mitigation solutions, please contact us.